Cal Crutchlow and Scott Redding spearhead the considerable British charge into Europe at the bwin Grand Prix of Spain at the legendary Jerez circuit in Spain on Sunday. Isle of Man – based Midlander Cal Crutchlow has started his third season in the MotoGP™ World Championship in superb form while 20 year old Gloucestershire rider Scott Redding leads the Moto2™ World Championship after the opening two rounds in Qatar and America. Crutchlow arrives at the 2.748 mile circuit in Southern Spain fired up to take on the factory bikes. Riding for the Satellite Monster Yamaha Tech 3 team he has grabbed fourth and fifth places already this year, led the final day of pre-season testing at Jerez and finished fourth last year. His new team-mate Bradley Smith won his first grand prix at Jerez in the 2009 125 cc race. The Oxfordshire rider scored his first ever MotoGP points in Texas with a 12th place and will be looking to push on over the weekend at a track he knows well and on which he has tested the MotoGP Yamaha. Ulsterman Michael Laverty also returns to a track on which he has tested the Paul Bird Motorsport CRT machine. He must fancy his chances of his first ever MotoGP points after impressive performances in the opening two races in his debut season. Redding has a four point lead in the Moto2 Championship after second and fifth places on the Marc VDS Kalex machine. The sparks will fly in the 26 lap race on Sunday with three riders sharing second place in the championship including Texas winner Nico Terol. Last year’s Jerez winner Pol Espargaro who crashed in Texas will also be a massive threat. Wiltshire teenager Danny Kent and Spanish-based Yorkshire man Kyle Smith chase their first points of the season at a circuit they both know well. After a couple of miserable seasons the experienced Kent-based Danny Webb is at last finding a change of fortune in the Moto3™ class. Riding the Ambrogio Racing Suter Honda he’s picked up points at the opening two rounds. Scottish teenager John McPhee could do with a change of fortune. His Caretta Technology FTR Honda was wrecked when he was taken out in the Qatar race which made for a tough time in Texas. He returns to Jerez in better shape. The Moto2 World Championship leader Scott Redding is the first British rider since Tom Herron in 1976 to lead the intermediate class in the MotoGP World Championship. It was 37 years ago that Herron led the 250 cc World Championship by a single point from Walter Villa after winning at the 1976 TT race in the Isle of Man. The last British rider to lead a World Championship was Bradley Smith in 2009. After his victory at the Italian Grand Prix in Mugello he led the 125 cc World Championship from Julian Simon by 3.5 points. The first MotoGP European grand prix of the season promises to provide a mighty confrontation at the bwin Grand Prix of Spain at Jerez on Sunday. After two superb opening races in Qatar and Texas the action switches to Europe around the 2.748 mile circuit in Southern Spain and all the components are in place for a continuation of the battle. World Champion Jorge Lorenzo and the youngest ever Premier class winner 20 year old Marc Marquez share the lead in the championship after a victory apiece at the opening two races. Factory Yamaha mounted Lorenzo has already two MotoGP victories in Jerez but Marquez has never won a grand prix there. Their respective team-mates Dani Pedrosa and Valentino Rossi have both tasted MotoGP success at Jerez and will be desperate to claw back the points advantage. Pedrosa riding the Repsol Honda was successful five years ago while Rossi has secured six wins on both Honda and Yamaha machinery. Diving right into the middle of those four factory riders will be Cal Crutchlow who has looked more than capable of mixing it with them in the opening two rounds. Riding the Monster Tech 3 Yamaha he has grabbed fifth and fourth places and also led the final day of testing this year at the track where he was fourth last year. Spaniard Alvaro Bautista injured his hand at that final test but has made a steady start on the Go and Fun Gresini Honda while the new Ducati pairing of Andrea Dovizioso and Nicky Hayden have made a solid start. It’s a marathon rather than a sprint for the Italian factory and so Dovizioso’s two seventh places represent the start of what could prove a long journey. They will be joined by test rider Michele Pirro in the 27 lap race. Former Moto2 World Champion Stefan Bradl was mighty relieved to finish fifth in America after crashing out on the LCR Honda in Qatar and will seek to climb from his tenth place just one point in front of the impressive Aleix Espargaro. The Spaniard was the top CRT bike last year and has put the Power Electronics Aspar ART top CRT at the opening two rounds, giving the likes of MotoGP newcomers Bradley Smith and Andrea Iannone a tough time. Iannone’s Pramac Ducati team-mate Ben Spies will miss the race still suffering from a shoulder injury sustained last year despite finishing 13th in his native Texas. Twenty year old Scott Redding leads the Moto2 World Championship after second and fifth places on the Marc VDS Kalex. Three riders shares second place just four points adrift. Former 125 cc World Champion Nico Terol won in Texas from Tito Rabat and Mika Kallio and they will be looking over their shoulders for Dominique Aegerter who’s made a brilliant start with two fourth place and Qatar winner Pol Espargaro. The Tuenti HP40 Pons Kalex rider crashed out in Texas but won his first Moto2 race at Jerez in difficult conditions last year. 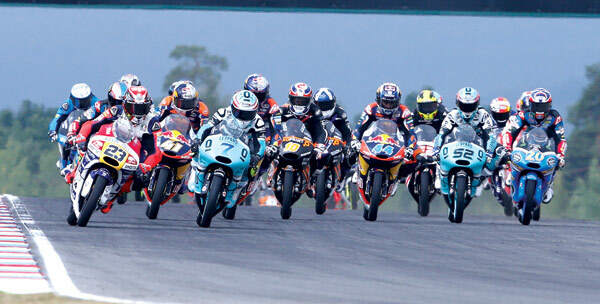 Just one point separates the three leading riders in the Moto3 Championship. Spanish teenager Alex Rins, after his first grand prix victory in Texas and Qatar winner Spaniard Luis Salom share the lead. Maverick Vinales’s two second places put him one point adrift and the fight between these three and many others is certain to continue in the 23 lap race on Sunday.